If you have a question or comment about something here on this site, it’s easy to get a reply from us by posting your comment where you are reading. We put our emails this way because humans can figure them out and we hope the bots can’t. Normally we reply to emails quite promptly but sometimes we travel or things happen. If you don’t get an answer to a question within a week, feel free to contact us again. I’ve been building a totally ‘Off the Grid’ home in No. California for a few years. It’s on 115 acres with half a mile of Trinity Riverfront. Is there any interest in people who want to take over and somewhat update current ‘Off the Grid” property? My name is Nathan Hoffman and I’m the Partnerships-Manager at FindMediaPartners.com. We would like to advertise some of our clients on your blog. Thanks in advance for the Details Maya ! We don’t place independent ads on this blog. We’ve been AWARDED this restaurant below and need a wood carpenter to install the La Tilla ceiling at the dining room area. May I please buy the plans for your $300.00 house? Which plan are you referring to? Could you build us a sandbag dome home about 600 sq ft in lake worth, Florida? Or do you know someone who can? There’s no way we could devote time to this project so we need someone to do it for us. Owen Geiger and I do not build houses for people; we just provide plans and information about them. You might connect with the folks at http://www.earthenhand.com/workshops.html or http://www.unitedearthbuilders.com/ about this. My name is Maya Sachasinh, I am a Bay Area native, college student at UC Berkeley and a life long social and environmental permaculturalist/activist. I wanted to reach out to ask for help spreading an incredible permaculture opportunity. For the past couple years I have helped start a bamboo construction company in coastal Ecuador after many years of facilitating restoration projects and research in the coastal tropical dry forests. Bamboo construction has been a great way for us to create incentive within the community to steward the forests, plus re stimulate the economy after disastrous earthquakes in 2016 and advocate for climate resiliency through green infrastructure development. Thus was founded, “Bahia Beach Construction”. Currently, we work to run supplemental green infrastructure courses for college students from over 10 universities, and after participating in some natural building workshops we received an incredible amount of demand to host a non-student trip on our new bamboo agroforestry farm. On this farm we are currently building a full on bamboo cultivation, curing, and carpentry training compound. What sets this trip apart is that folks from all over will have the opportunity to build structures with us start to finish while completing our bamboo cultivation and carpentry course, as well as have the option to design and create original designs on the farm with tools and materials provided! One of the many things we hope to create a platform for during this workshop is experimentation with knowledge of other natural and alternative builders from all walks of life. I have ready to send an email template, promotional flyer, and 4-page brochure for this non-student program. All information about our company and registration for the workshop can be found here on out website. If there is any way you could help us by circulating this announcement through your networks: social media posts, newsletters, website, email lists etc. I would be incredibly appreciative! It is so important now more than every to be turning to the areas of the planet experiencing devastation from climate change and understanding the patterns of innovation and resilience that emerge from people to then be translated into active solutions and progress. Please let me know if this is something you could do or any other networks you recommend I reach out to, thank you for all the powerful work you do in the world! Thanks for telling me this. Sounds like a great project so I will copy and paste and put on our blog soon, okay? I live in Fujian Province, China. The climate is sub-tropical monsoon. I want to build a 3 meter diameter raised bed. Originally, I was planning to build a geodesic dome greenhouse, but I think the summers are too hot for this. Instead, I want to build a 6 meter diameter earthbag round wall (3 meters high) around the garden for wind protection and privacy. The style would be similar to the Chinese Hakka houses. I don’t want to build an enclosed roof, only a roof to cover the walls and 1.5 meters inside the garden round house. My question is, how can I protect the plants and soil from the heavy rains which occur during rainy season? I wanted to let you know that you’re offering a great service and I appreciate your business. Thanks for the tip. This is the first I’ve heard of this project and method. There’s very little technical detail provided so I’ll keep comments to a minimum. They build deep into the desert soil below grade due to the high heat and hurricane risk. Normally homes like this would quickly flood but it can work in a desert. It looks like they start the dome roof a little below grade so the weight is transferred laterally into the soil. By “hanging earthbags” they probably mean corbeling = overhanging bags from the previous course. So this could potentially work and be safe. It’s all a matter of using the correct details so all that weight overhead doesn’t come crashing down in a 100 year rainstorm, etc. I’m definitely excited about learning more. I’ll contact Rysheak soon. Owen, can you write a blog post about this topic? I like the idea of using mesh bags. In addition, if the bamboo overhang method is safe, I could build a true dome shape. I will once I get more info. I wrote him already. Stories like this often take time to sort out. Heavy earthbags in a low angle dome could be dangerous so until we know more I’ve already come up with a simple alternative that anyone can do. These shape of domes and vaults are commonly made in Mexico with porous lightweight clay bricks. It would be easy to do the same thing with homemade earthbag scoria blocks made with raschel mesh bags, scoria and quick setting cement or glue. Mass produce the scoria bags in simple wooden forms, set aside and then build the dome using standard brick methods that masons there already know. In Mexico the labor is so cheap I would hire some help. There are videos on YouTube, etc. We even did an article about this a few years ago. It’s easy to find info by searching YouTube for Dome Building Mexico and you’ll see numerous videos pop up. Hi , Where can i buy a container frame ? Read the articles that I linked and search those links. This query is about plastic trash bale house promoted by Mr.Harvey Lacey. I am a retired Civil-Structural Engineer from India. Can the bale size be made smaller such that the block volume is about just a cubic foot, weighing around 32 pounds (14.5 Kg)? This will enable the impoverished physically weak, under-fed tribes of the tropical slums of Asia will be able to handle them with much ease? See tomorrow’s blog post about the SET project in India. The program director tried for two years or so to make plastic bales efficiently. The machines never worked as hoped. After extensive trial and error and lots of frustration, the director contacted me and I explained how to do “thin wall” earthbags using local sandy soil with rebar pinning. It worked great. Read her report. S.O.S. SAN MIGUEL ALLENDER CENTER. WE NEED TO CONTACT YOU TO PROPOSE YOUR BUILDING TO RECONSTRUCT THE HOUSES DESTROYED IN SOUTHER MORELOS – CHIAPAS AND OAXACA. NOW IS THE TIME TO LET EVERYONE KNOW ABOUT HOW WONDERFULL EARTHBAG BUILDING IS . I have been waiting for an occasion to promote your building technique for years now! PLEASE – HELP. 52-777-3111868 – IN CUERNAVACA. FRANCES. I don’t speak Spanish and don’t use facebook. I’ll send this to Kelly. Hi Frances — Unfortunately it has been several years since we have had contact with the people who were doing earthbag building in the San Miguel de Allende area. So far as we know, they are not doing earthbag building any more. Neither my husband Kelly Hart nor Owen Geiger are available to go to Mexico, though if someone else takes the initiative, they may be able to answer some questions. My husband and I live in the US and Owen lives in Asia. I went to Facebook and did a search on Jade Silva. I didn’t see anything to do with building. I can read Spanish but it didn’t help in this case! I’m interested in building a mostly above ground swimming pool in Hawaii, are there instructions or plans available for that or where would you suggest I get started? There’s no need for plans because the process is so simple. Ideally you could get high quality swimming pool cement and talk to local plasterers to find out what tools you’ll need. Once that is worked out then simply stack gravel bags around the edges of your pool. The height depends on the size of the pool, workmanship, width of bag wall and details of the design such as tying the bags together with twine for greater stability or wrapping the wall in mesh or adding occasional buttressing on the outside of the wall. I recommend building a low wall of no more than 2 feet high and digging into the ground for the remaining depth. Read as much about pool building as you can to help eliminate mistakes. Keep the pool small and simple or you may get overwhelmed with the task. I would like to count on you to validate a part of my phD research. In this phase, I created an online tool to design earthbag/SUPERADOBE volumetric domes. Please try it and fill the form about your experience. I´d appreciate if you can share with your contacts. I’m pretty busy now so maybe I’ll do a blog post and let dome builders try it out and provide feedback. How do I instal a floor? What goes between a floor and the ground? What’s the best material for the actual floor? Tile, wood, etc.? Will a fireplace heat the whole house, in which case I won’t need to pay for heating? And if I want to heat my bedroom which will not be in the main room, but a separate attached one, will I need a fireplace there as well? How do I figure out plumbing? I know how to add the pipes through the bags, but figuring out what I will need for a house. Especially since none of the plans I can purchase include any info on plumbing. Or are there plans that include plumbing/electric? How far down should I dig to test the soil if I’m digging in a back yard? Is it alright to dig partially underground so I have a .5 lower floor? If I do, does the adjusted lower foundation have to go around the entire house, or just adjust to the lowered part? How stable/structurally sound is a second floor? Does it require significant. engineering? Or is it just better to build a separate hut so I don’t have to pay for an engineer to tell me how to make it safe? Is it significantly easier to build it with a metal/wood roof, rather than a dome? How do I install cabinets and cupboards inside the wall?8i If I don’t want to have to hang them on the wall. How do I hang things on the wall if I can’t screw something into an earthbag? I’ve read people can use old pallets for wood, can I use it to frame a house? Sorry I know it’s a lot. I am just a little confused on these specific things. My earthbag ebook answers most of your questions. The rest you can learn from carpentry books at a library. Let me inform that how can i obtain terrazyme in pakistan?? Search online and in the phone book. I recommend careful study of the New Zealand earth building codes and also learning as much as you can about earthbag building in Nepal. Also check out Patti Stouter’s websites and earthbag tests. I am contacting you because I thought you might be interested in knowing that we are selling our domain PalletHomes.com ; the search term ” pallet homes ” receives an average of 140 exact-match searches per month (roughly 4 per day) on Google alone and owning this domain would be an asset to your marketing efforts. 85% of people search online for local services. 94% of those people don’t go beyond the first search page. If you are interested or have any questions about the domain please don’t hesitate to ask. The link doesn’t work for me. Please check again and then I’ll add to your comment. 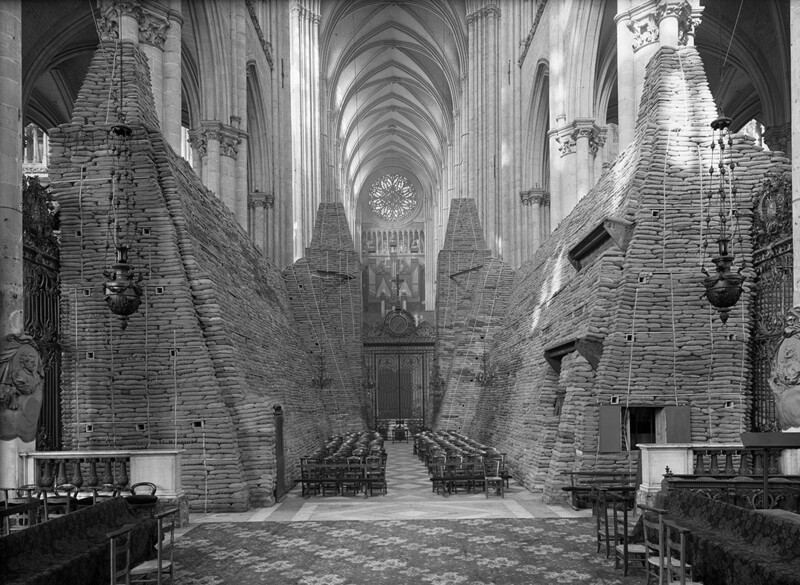 It’s the Cathedral of Amiens (France) during World War II. I was wondering do you offer custom plans and designs? Sorry, I no longer do custom plans. It’s too time consuming working over the Internet. I’m hoping you can answer an idle thought I had this evening. I want to build a home with natural techniques I have researched rammed earth, Adobe, super adobe, you name it. I had settled on building am earthbag home as a retire ment home for my wife and my self. I’m a combat vet and I lived around “hesco barriers” day in and day out, and it struck me today, what if I laid out my walls with cattle panel, like forms for rammed earth, lined them with burlap (or other suitable material) and filled and tamped like rammed earth? Then left the cattle panel in place and plastered/stucco over it? Once you finish the first course you could overlap the top and bottom form walls by about 18 inches tie them off and continue to fill. Obviously the “forms walls” would be tied together to keep them from bulging……I know that’s a lot ha ha, any information would be appreciated. P.S. I’m from central texas and plan to use claliche as the fill, caliche is mostly limestone dust with some limestone gravel and mabey up to .75 stones mostly dust though it gets rock hard with a little moisture and pressure. Bend the cattle panels into curved or round shapes, stake in place with rebar and fill in layers. Round/curved shapes are very strong. Abe used recycled billboard as a liner. Please document your project and share with others. Countless millions of people need affordable housing and this is one viable technique. I am a license civil engineer here in the Philippines and taking my thesis study in Architecture as my second course. And I’m making earthbag system as one of my design feature in my thesis proposal. I am very interested to make connections with your team especially here in the Philippines so I can visit your team’s implemented and on-going construction. I gratefully recognized whatever contact information and response I can receive from your team and I am willing to offer any information you need. I do not have a team in the Philippines. I visited there about two years ago to check some projects and then reported what I learned on this blog. The biggest project is in Coron. That’s where they’re rebuilding a whole village with earthbags. They are using a unique, slower than normal building technique, but it’s working very well. You could build the same house in half the time with earthbag tubes, but they want the walls perfectly flat and plumb so to them it’s worth spending extra time. There are numerous smaller projects also, including affordable homes being built by a Peace church that operates out of Canada. The director just emailed and said he hopes to send me an updated story soon. my girlfriend and myself just moved to the Philippines. We are based in Palawan, north of El Nido town. Right now we are planning on opening a farmtourism place in which we want to include an earthbag building. Maybe we can connect and discuss earthbag building in the Philippines, different techniques etc.?! Would be interesting to hear your approach and experience with local buildings! Owen, so far I read many different “recipes” for the mixture inside the earthbags. What works best for you? And when do you wet the mixture?Before putting it in the bags or after laying them down just before tamping? I don’t live in the PI but there are numerous earthbag builders who do. Hi, I’m a Brazilian Civil Engineering student. My course completion work is about Compressed Earth Block slicing. I would like to know if there are ISO’s talking about the construction with this material, and if you can send me material on the subject. I want to know abut the doom House single room with kitchen and bath how i can build it and what help you will do in that. Link please. There are numerous dome plans. Sorry, I no longer do custom plans except in a few rare cases. What are you referring to? Please clarify or I will delete this message. Hi. I was wanting to ask about the article “Earthbag Foundation for SB House in Haiti” Won’t the concrete poured over the trench foundation wick water up to the earth bags? I’m probably missing something and am wrong but I’m asking anyway. lol Thanks so much! That was someone else’s project. They either used 1. gravel bags that don’t wick moisture, 2. put a moisture barrier (plastic sheeting) between the foundation and bales. My wife and I, along with our youngest daughter of 28 who is totally handicapped and three grandchildren love the Torus design. But we would need to connect both sides to make one home. Also would need if possible a fifth bedroom. Besides the Master Bath, our daughter needs a master bath. Would need a basement all the way round identical shape as the main floor except the rooms would be different as in a game room and so forth and a safe room for tornadoes and other disasters. A ramp type stair system that descends gradually to the basement for a wheel chair. We would like the structure made of hempcrete and natural colored plasters for exterior and interior color. Hempcrete flooring covered with a clay flooring. We want to incorporate thermal rocket mass heaters. Utilities of solar and wind power, along with a roof that catches water for storage and solar hot water heaters and tank less water heaters too. I would need to have someone that is knowledgeable in hempcrete construction. We live in Northeast Iowa. Can you help. If it looks like things will work out, you can buy my CAD plans and pay an architect or designer to modify the plans as you describe above. The Castle Tower House is largely the same plan as the 2-story Roundhouse Above Survival Shelter with a crenellated roof design. In the earthbag castle I’m currently designing it’s used as a corner ‘watch tower’. Its primary function in ‘peace time’ is a guesthouse or office. Compare this version to the original plan to see how a few minor changes can make a lot of difference in appearance. Description: Every castle worth its name has to have at least one underground survival shelter. In this case it’s underneath the Tower House. It’s prudent to have a safe place to go to in case of emergencies, and what better place than your basement. Hurricanes, tornadoes, blizzards and other natural disasters are all too common. While others panic and run for last minute preparations, you can calmly retreat to your basement (through a hidden trap door) that’s wisely stocked with everything you need to ride out the disaster. More details on the Earthbag Survival Shelter that’s also sold separately (an excellent starter project and one of my most popular designs). Go to my Earthbag Plans page. The first message there explains how to order plans. What a fascinating website and blog you have! I can’t wait to read through the many articles and posts. We are fairly new to eco/green building and have looked at various options. We are investigating building with a wood-crete-lyme-sand mix and am interested that you make no mention of it on your site. (I did a search first) Is there a reason for this? Is it not as good as they say it is? The info on the Web is fairly hard to come by. I have found some recipes but not really much seems to be known about it if I compare it to Strawbale or Papercrete. The Cordwood could also possibly work for us. We live in South Africa and have easy access to Pine sawdust. We have a small 30 hectare farm that is in an area that is zoned as fully rural so building codes are not an issue. Thank you so much for all the links – most appreciated! We will have a good look through them. Glad to hear from you and your interest in doing more projects. Write me anytime. My email is at the top of the page under About Us. Hopefully you’ve been reading my recent reports about projects in Nepal. More are in the pipeline. NGOs in Nepal are starting to churn out projects now on a fairly regular basis — about 10 days for earthbag walls on a small school. It’s very exciting. One test to determine if ideas are practical is to see if they catch on and spread naturally. That’s what’s happening now as two other projects in the area are taking off — 18 houses by Michael Smith of Woven Earth and another one by Carisimo in collaboration with Good Earth Nepal. Owen: My wife and I are retired and want to down size. Both of us are very handy and healthy. Very interested in earth bag construction if possible for our area. I have 4 paid for acres in Collin County, Texas, about 30 miles north of Dallas. Don’t know if building code would allow it. We have a gentle slope and want to build into it to include a safe room (tornado shelter and root cellar). Love you plan. Summers are hot (90+) and winters can drop to the teens at times, but mostly fairly mild with frost at night. I want to collect water and use as much solar tech as possible. Would the green house need to be detached from the main building? Which way should the opening face? What kind of windows and doors do you recommend? We are also thinking of using the roof as part of the vegetable/herb garden. As far as fire exit, I thought of leaving the back of the home about three feet above ground for ventilation, light, and emergency exit. Your thoughts please. Great blog, thanks. What plan are you referring to? I have over 120 plans. Earthbag is perfect in hot climates and rainy climates. Texas has fairly lax codes in rural areas, although being that close to Dallas it depends what county you’re in. If it has to be code approved then contact Structure1.com engineering. However, that will raise the cost significantly due to all the extra materials, red tape, inspections, etc. Yes, greenhouses are typically separated from living spaces because the needs of plants and the needs of people are different. Always start small on a tool shed etc. to learn the basics before doing a big project. There’s a learning curve to everything. I am interested in learning more about your Superior Sandbag System and the cost of this product. I was wondering if some of these homes can be visited in Costa Rica. I have my home and property for sale in the Puriscal area. After I sell it I will buy a vacant property and would like to build a earth bag home on it. I don’t have the contact information for most projects in the world. There are just too many to keep track of. Try asking around and see what you can find. Maybe talk to suppliers of earthbags and polypropylene tubing, and also green architects in your area. Often times there is a network of natural builders in each country. My email is at the top of this page and every other page. I have 300$ I’d like to use to build an earth bag house. That’s about how much my emergency earthbag shelter costs. This is the base cost using recycled roof materials. The price does not include reinforcement for earthquake zones. Sorry, I don’t know their number. I am doing a project on one of the islands in Indonesia. We are away from the mainstream of most business and don’t have many choices. Earth bags…or what can’t we use. Rice bags or cement bags. Dimensions? Earthbag is ideal for Indonesia due to the earthquake and hurricane resistance, plus low cost, do it yourself properties. Minimal outside materials and tools are needed. Rice bags and other types of grain bags are perfect. Do not use bags with plastic liners. That would prevent the soil from drying out. Use 18″ wide bags or tubes. Tubes are faster than bags if you can get them. I’m almost sure they’re available in Jakarta. Stay in touch. My email is on the top of every page. many thanks for a quick reply! 33 may be an option if 2 stores (levels) are possible with such diameter. But even if 2 stores are not possible there is always a design solution like two standalone 33′ diameter with small intersection between. What do you think regarding two store building, i.e. 33′ diameter, walls about 2.6′ wide and 9.7′ height, region with high seismic activity (9 on the Richter scale)? Definitely make two one-story structures. Make the connecting space so it can break away. This is easily done if you use different materials such as wood framing for this area. Each roundhouse will be very stable, but they’ll shake a roll differently since they’re spaced apart. That means the connecting space will likely fail. Design it so this part can be rebuilt easily. Lower height walls about 8′-9′ high will be more stable. Be sure to include a bond beam and all of the earthquake resistant ideas we’ve developed for Haiti and Nepal. 2-1/2′ thick walls require too much labor and materials. Earthbag is labor intensive. I’d recommend standard 24″ wide bags measured when flat and empty. This will make a wall about 19″ thick before plastering. Always start on a small project like a tool shed to learn the basic skills. i’m planning to build a round house with earth bags technology. The thing which worries me is the maximum diameter of the structure. My aim is to build house with diameter 50’ . I have found planning example which i really like http://www.monolithic.org/homes/floorplans/floorplans-pc/callisto-i but i’m not sure whether it is possible to build such structure with earth bags. The largest stable roundhouse diameter is around 33′. You can go larger if you incorporate some way to stabilize the walls — buttresses, posts, rebar, etc. You’ll need professional help with this part if you’re not a builder. But it doesn’t have to be complicated. Ex: add posts about 10′ apart. I am interested in the near future to build a hempcrete home and the sand bag concept is quite interesting. I would like to know cost per square foot on a complete home that would be designed around my daughter who is totally handicap. I like the round design with the inner gardens. But I would like to design one that is larger. 5 bedrooms with all of their own bathrooms. The master with two enclosed toilets; a his and hers. Also the rest of the bathrooms enclosed as well. Two 1/2 baths as well for other guests. Short answer: you’ll have to make a spreadsheet itemizing the materials and quantities you’ll use. Also, we always recommend experimenting on a small tool shed, etc. to learn the basics first. Then build a small round guesthouse, etc. to further develop your skills before going large. A Las Vegas resident here. I would like to know when will the next workshop be held? I would really like to participate. I’m not doing many workshops any more except the ones I just finished in Nepal. Search our Workshop page at Earthbag Building.com for a workshop near you. Excellent work! I will publish this on our blog soon. Thanks for sharing. Yes, that’s true. Thanks for sharing. Would like to know is your green wall system consist of green bag system? I’m looking for a green bag system for retaining wall. Please reply to my email address as shown above. Your prompt reply is greatly appreciated.. Thank you. The natural water table across your soil profile is key. See “Open Book planting beds” for similar ideas as yourself. I just read your great article on Growing Your Own Home, very inspiring. In return we will provide banner ad space for your book. Let me know that you’re interested and we can have a phone chat. Hi Darlene. Please email me. My address is at the top of the page under About Us. I writed you just after the earthshake in népal but I haven’t answer. So, I permise me to ask you if you would can precise me where I should visit a earthbag house in népal. I go in népal in august and responsible for a humanitarian organization, we plan to build a children’s home. we would like to show such a construction to our Nepalese friend who would lead this project. Is there are such constructions in the plain of Kathmandu ? Thank you of your answer. I was wondering if you could possibly get me in touch with some fellow earthies out in Nepal? I am at everyones service to help with any rebuild projects come November. I have a great understanding of earthbag buildings, a plumber by trade and a lot of helpful volunteers at my fingertips. I guarantee it won’t be hard to find a volunteer position. We are the manufacturer and exporter of Jute products. Our newly developed product which is Water repellent Jute fabric. Here are some of its uses. WHAT IS WATER REPPLANT JUTE FABRIC (WRJF). 1 POTATO BAGS: – WRJF is used to cargo your potato bags with required humidity, prevent damages and cure from fungus. Can repellent water during travelling and save the potato till their final destination. 2 SAND BAGS: – WRJF is used to make your sand bags to protect from flood water .Shops, Houses or basements area for a longer period of time. 3 RICE BAGS: – WRJF is used to save rice for a longer period of time from rain and humid weather. 4 COFFEE BAGS:- WRJF is used to save coffee seeds in traveling and it doesn’t react or damage with water during traveling or storage. 5 RAIN COAT:- WRJF is used to make rain coats. It’s cheap and used multiple times. it feels light when your raincoat protect you and your fellow members from rain. 6 COVERING PLANT FROM HEAVY RAIN OR SUN LIGHT: – WRJF is also used to cover your growing plant to destroy from rain and burn from sum light. 7 COVER CARS:- WRJF it can cover your car during Snow fall. 8 COVER WET FLOOR:- WRJF is used on wet floor in your party area or snow on your roof. Snow can slip down and save your houses from damages. 9 CATTLLES:- WRJF is used to cover cattle like cows, goats, camels, horses from raining season or from winter season. Or you can use this WRJF to cob either huts. It is going to protect from rain too. 10 IMPORTANT DOCOMENT COVER:- WRJF material cover your document for humidity season or protect from water too . What chemical is used to make them water repellant? What is the cost comparison to poly bags? This should go on our free Bulletin Board where people can see it. See link at top of page. I a senior medical oncologist serving in prime cancer hospital of Nepal in Bharatpur Chitwan.I do charity work mainly providing scholarship for Chepanng students.Chepang community is highly marginalized and poverty stricken.They live mainly in hilly areas of Chitwan,Makwanpur,Dhading and Gorkha.Most of the schools in Chepang hill tracts are destroyed by Earthquake of 25 April and following after shocks.I want to construct one 5 roomed primary Eathbag school to replace damaged school.I hope it can be example, inspiration and encouragement for others.I will raise money mainly from my relatives.Please give me information. Can you send volunteers to guide us? 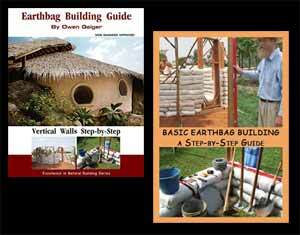 We provide educational materials that show how to build with earthbags. You’ll have to organize things and line up volunteers. We can probably get you free school plans. Dear Mr. Owen..thanks for your response. I am interested to buy the plans in PDF/CD of roundhouse design. I want to know if all the materials to used for the constructions was described on the plans? i am very much interested to have an ambient temperature inside of the house like what you have told and described on this roundhouse. Thank you and more power! Email me at naturalhouses [AT] gmail.com and tell me which plan you’re interested in. I don’t provide materials lists because most likely things will vary from one site to another. Plus, most people make changes. A pleasant good day. I would to ask if you are conducting any actual training by invitations. I am a filippino and would like to learn and introduce this to my country. i have a portion of land in Coron Palawan and i would like to make a sample of one of your round house design. Can you give me the cost of this type of bungalow please. If in case there’s a posibility for you to visit and conduct a training in the Philippines , how much is your service fee for this request. Hoping for your kind and immediate response. Thank you and more power! Read this introductory article and you’ll know 99% of everything you need. Since you’re interested in rebuilding the Philippines with earthbags you’re invited to my upcoming free earthbag workshops in Thailand. But if you study the two articles above, and watch my free YouTube videos, you really don’t need a workshop. Just jump in and start experimenting with some bags and you’ll soon figure it out. You show a photo of “dozens of CEB shapes”. Can you tell me who manufactures the machine that produce these shapes that appear to include, corners, lintels etc.??? Search the Internet. There are numerous brands available. We don’t make or sell the machines. We’re just reporting on various natural building products and building methods. One brand we highlighted on our blog a few years ago is Star Top, but there are other brands. I notice that you a water generating method using a vortex tube. Where can I get one? can you help me? I was so happy to see what you had done for the folks in Haiti and since my husband’s family is in Nepal and lost there house this weekend we are wondering if you would consider doing training for people living in rural Nepal. Most of his village was wiped out by this weekend’s earthquake. people will not have resources to build any better than they had before unless earth bag construction can be taught so they can get back on their feet quickly. please let me know if you are interested in helping and how we could help facilitate it. We are unable to help everyone around the world, so we’ve put almost 3,000 pages of free information on the Internet to help share this information. Earthbag building is very simple and anyone can quickly learn how to build this way. We have free videos that show every simple, beginner articles that show every step. For those in developing countries be sure to visit Earthbag Structures.com where we consolidate all the best information for disaster areas. 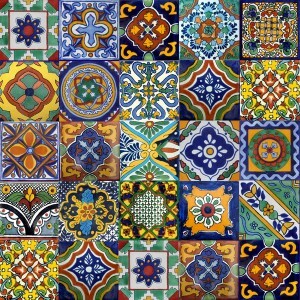 Hi, the image http://www.naturalbuildingblog.com/wp-content/uploads/mexican-tile-300×300.jpg came from our site mexican-tile.net. I dont mind others using our images but I would appreciate if the image link was directed to the site the image came from. We always show a link to the source. Look at the bottom of the blog post. Please on behalf of my Partners in Poverty Alleviation an NGO based in Ghana. We intend to build 300 homes in Ghana and will like to know the total number of earth bags, we will need to build the 300 homes (made up of 3 sizes thus 600 sq ft,1200 sq ft and 2500 sq ft.) and how much that will cost us. from where we will get this portable sawmill in Bhutan. and plaease can you tell me the detail price also. You’ll have to contact the company. VERY GLAD to read about Permitted Earth-bag Dome Home in Florida! Would like to briefly discuss blueprints purchase. Will gladly consider working with GTC Design Group in Florida (as indicated on your blog). Email me. My address is at the top of the page under About Us. Hi my name is Edna from the pueblo of Laguna and i was wondering if you or your company can give me some information on building adobe house? I just moved back home and planning to stay here for the rest of my life, my mom was raised here and was giving a piece of land and now she gave this land to me and i would like to have a home of my home for me and my little family, 4 years ago my life had changed in a good way i took in my twin nephews and would love for them to have a good life if it wasn’t for my daughter here with me i don’t know what i would do, im handicap and i need help with lots of stuff, please if you can help me i would very much appreciate it..Thank YOU.. I live in an earth shelter built in 1980. It uses thermo-convective heating, with an electric in-line heater and infra-red auxiliary heaters. I am looking to modernize the heating system. Do you have any sources? Surely there must have been some advances in this technology. I am in Ontario, Canada, but the sources don’t have to be in Canada. I find it quite incredible to first get to this video: https://www.youtube.com/watch?v=87QbihHDRlw, then the website, looking on various pages and don’t finding your location…. where is this farm from the video????? i must design underground poultry and build it . i want for paper university . can you send papers about underground house ? Search our site for underground houses and you’ll get a few ideas. I don’t have anything specific for what you’re doing. But the last email described in general how to do it. 2 -how many save energy for poultry ? 3 -how many thickness soil of roof ? 4 -how many meter underground i must construction foundation poultry house ? 5 -can you send pdf files about performance energy saving underground house ? 6- in the world there is not even one poultry house for test this system ? No one has built an earthbag poultry house as far as I know. It should work fine if you use good building techniques. No cooling will be needed if you use the methods I describe in Passive Cooling Strategies on this blog (search this site). You may want to add ceiling fans to improve ventilation. No need to go real deep if you use earthbags and grass covered earth berm around the sides. Earth is heavy and so earth on roofs (living roofs) gets expensive and a lot of work. Use white or silver color metal roofing for best value. Add some translucent panels for natural daylighting. Add space between the bond beam and roof so breezes can easily blow throw. Add windows that are shaded by roof overhangs. Then read more details on this site by searching keywords raschel mesh and hyperadobe. Mesh tubing like this is way faster than using bags. the industrial poultry house need very energy for heating and cooling also we know that temperature of earth shelter (3 meter underground ) at all of year is between 15-20 centigrade . why there is not underground poultry house ? Underground construction is more expensive and more prone to flooding. It’s simpler, faster and easier to build above ground. The owner’s might not be aware of building below grade. Drainage would be more complicated and costly. So there are numerous factors involved. I would like your opinion on including styrofoam pellets in the first coat of stucco plaster on round buildings. This is for insulation purposes as a am really trying to figure out how to solve the adverse thermal mass effect for the tropics. You don’t need insulation in the tropics. You want to use proper design techniques as I’ve described in previous blog posts called Passive Cooling Strategies. Search this blog. These are low cost, simple methods. No need for AC or insulating plaster. I love the concept of the sand bags. You can literally build a house into any shape and design. It would also offer awesome insulation factors. The one question I have, is it possible to use hempcrete as your outer and inner wall covering instead of clay? And one more question. Does the sand bag walls breath like hempcrete? Insulation: soil will stabilize the indoor temperature in mild climates due to the thick thermal mass, but it’s actually low in R-value. In cold climates, add insulation board on the exterior or use lava rock in the bags. Yes to hempcrete plaster and vapor permeability through earthbag walls. Always provide adequate insulation. My husband and I are passionate about natural homes. We are currently looking to find any classes that my husband can take to learn to construct natural homes as he wants to change careers and focus on natural buildings. Please let us know where he can take these classes stateside. We live in Virginia so preferrably something close to us but even if it is far off let us know as he really wants to do it so we might be able to take classes a little farther off. Thanks for your efforts to make the world a better place. There are several large natural building workshop websites that you can find on the Internet. You can also search the Bulletin Board on this site and the Workshop page at Earthbag Building.com. Also search online for work/trade opportunities such as WWOOFing. You help out for a weekend or whatever in exchange for learning and free lunch. There are popular WWOOF and Workx websites. Can you advise as to a pumice/scoria – lime mixture that would be deliverable by a 4″ trash pump, to be used as infill? Your thoughts? Search online for a pumicecrete formula. It’s common in the New Mexico area. Awesome site, thank you all! Make some test bags using somewhere between 5%-10% lime. It does not have to be as strong as concrete, just strong enough to hold together, so I think 5% should work. here we use jumbo lawn but i do not think its a good idea because i need a material which would be used as an insulation as well as it holds the plaster on brick surface..
jumbo has smooth surface so plaster wont stay on it.. which material should i use? I don’t know what jumbo lawn is. Talk to local builders and building supply centers to learn what they recommend. and it has semi-arid climate. yes I know its a rare combination and i could not find any information regarding this. I do not want to use wood because it causes a lot of deforestation. I am planning for something traditional and brick is one of the local material here. so what would u prefer? All you really need is 2-3″ of insulation on the outside of the bricks. Is there any other insulating material available that can be applied at this thickness? Ideally it would not be easily damaged with water. I need information regarding construction detail of straw bale with burnt clay brick framework as a load bearing structure. (brick is a local material here). can u recommend me case studies regarding the same method if any construction is done previously? What is your climate like? What country? This combination of materials is not common. There may be a simpler approach. I plan to start doing workshops again next year. In the meantime, I suggest building some small structure such as a tool shed to develop your skills. So learn by doing. You’ll figure it out quickly. by the way, all these three email address you gave were rejected by the computer when i tried sending an email. hence i had to send my inquiry thru this area for comments. my apologies if i did the wrong thing but then again, i had no choice. You have to replace “AT” with the @ symbol on your keyboard. That’s so computer programs can’t grab them and send us mountains of spam. Martin Holladay seems to have a personal problem with Michael Reynolds, it shows, and his lies totally undermine the credibility of the article. Shame on you for being so desperate as to publish such a piece of garbage. You owe Michael an apology and you owe your readers the truth. I skimmed the article and read it more carefully later. Im trying to debunk this post going around can you help? its giving Michael Reynolds a bad rap calling him a liar and a cheat basically and it really annoys me! I am thinking about building – or arranging a team to build with myself working alongside – a natural (preferably round) home in Barbados. Is there anyone out there who has built in the Caribbean or would please be able to put me in touch with someone who knows? I am brand new to this movement, very interested and keen really to work with a team who would let me learn as we go. I’m attracted to natural house-building aesthetically,ecologically and financially! I’m after something visually lovely. That’s important for me. Something that complements the land. Please feel free to contact me via my website (yoga, meditation and healing). Many thanks. Yes, others have built in the Caribbean. Search our websites by country names and keywords such as ‘island’ or ‘beach’ or ‘tropical’. One project that pops in mind is the Sand Castle. I’m considering building an alternative type of house in Florida. In the county I am currently in (Lake) they seem to have nothing but a wall of regulations. Are there any counties that are most “friendly” and if so what type of building materials do you think would be best for our climate and possible hurricanes? I would have a 3 to five acre plot. Florida is one of the worst/strictest states for building codes. All those codes will double construction costs. I would go elsewhere. General advice for building in hurricane areas: build roundhouses with concrete bond beam and hurricane tie-downs. Domes would work but are vulnerable to leaks. The wind will blow around the structure instead of against it. We are building with Earthbags and bamboo in Costa Rica. Our organic farm is becoming a permaculture community with alternative sustainable dwellings. This is going to be a very busy year. See the farm here. Great. Please document your project and send occasional updates. Take lots of high res photos. Hi, are there any existing earthbag communities I can move to in the world, or in the United States, at least? I figure it’s better to join a political mass of extant earthbaggers, than to go out on my own and get wiped out by some new zoning or building ordinance. Search our sites (Natural Building Blog and Earthbag Building.com). We profile every good project we come across. There are numerous communities springing up around the world. Awesome, thanks again for your help! Post and beam is a great way to build for numerous reasons. Posts strengthen the wall as you. You can get the roof up and add the bags or tubes later. Code compliance is easier. Search our blog. We have lots of info on this topic. There are lots of different methods. But for the specific spacing of posts, etc. there are too many variables involved to give general advice. That part is typically done by an engineer who has all the information for your project. Bags of loose fill material such as scoria are inherently unstable because they can shift. Scoria works great for small structures, particularly domes, round and curved structures. Scoria and other loose fill materials are problematic on long straight walls. Look up Scoria Casita Earthbag House for details. Contact Structure1.com. They’re experts in ferrocement. 3) R-value of both methods. Thanks for all your efforts to teach us! You can stack bales for a 750 sq. ft. house in 1-2 days. Cordwood would take weeks. Cost depends on price of bales. Don’t forget to include something for labor (everybody’s time is worth something). The problem with strawbale is the risk of moisture damage. This is greatly minimized by building a post and beam frame and finishing the roof before installing the bales. For all these reasons, strawbale has just been adopted into the national building code. Story coming soon. If I am going to put a concrete slab under your earth bags to build a storage building approximately 21ft by 15 feet, how thick would it have to be to support the weight! We’ve already emailed you. Earthbag foundations are standard. Use concrete if you need a building permit. Looking for anyone in Arizona building with Earth Bag, so I may visit to get the idea and scope of it. This should go on our Bulletin Board page. Please repost and I’ll delete this one. If you have competitive prices then send this to Kelly Hart (address at top of page) and he will add it to our Resources page at Earthbag Building.com. I am interested in your pressed clay brick machine but I want to know more about it in order to make my final decisions. 1. Can you provide pressed clay brick machine with the product 10000pcs/day? 2. Is strength of the brick more then burnt brick or less then burnt brick? 3. I need detail about the red color, how can we produce it with a red color? 4. How much fuel per hour does it need (10000pcs/day machine)? 5. How many workers do we need for the machine to produce 10000pcs/day? 6. Please send me some sample pictures of the brick that this machine has produced and also some pictures of the walls that are made of this machine product? You’ll have to contact the manufacturer. Hello, I will like to know if you build homes of earth-bag material, I am very interested to get an estimate from the Christopher’s Castle Design, I love that plan…if you build these houses please respond to the email provided or let me know where I can find an earth-bag construction agencies, thank you very much!!!. My wife and I are thinking about opening a B&B with individual rooms (buildings) would you designs work for something like that? We don’t need kitchens at they are basically hotel rooms with a bathroom. Sorry, I no longer do custom plans. You might find one of my stock plans at Earthbag House Plans that will work. Or just follow the directions in my Earthbag Guide ebook and you’ll be fine. I saw the post about the pole house build, in the U.K.
Have either of you considered a like idea for the US? I would guess it would a build with straw bales. I would definitely like to see your version. In general, we are big fans of pole building. Pole building meets code. It’s fast, easy and cost effective. There are minimal foundation requirements. You can utilize lower cost sloped lots effectively. A skilled crew can build an entire barn in one week. You can buy code approved kits or build from scratch. Pole building can be combined with earthbags, straw bales, etc. You can finish the roof first and add the bales etc. later. Note: our search engine struggles with our site since it’s getting so big. Use google or another search engine to search this site. Note how different search terms will turn up different results. Ex: post and beam, pole barn, pole building, etc. One blog post has a link to a free ebook on pole building. I have a house with a window well, I am getting too much water in the well, I need a cover, the opening from foundation to the end of the well is 57″ and the widest part is 72″. Use a search engine to locate window well covers. You could also make one. We will start building with earthbag tubes and bamboo trusses later this year. Love your little 12′ round, plan to bump out the bathroom and build these as a hotel room duplex, joined with a big roof and lots of overhang. We get between 240 and 300″ of rain a year in the mountains of a Costa Rican Rainforest. Sharing how-to is part of our goal, a local training program for those who want to learn new skills. We live very rural and skills would help our neighbors to improve their lives. Thank you for sharing your knowledge and if ever we can be of service, please let us know. We have a big farm, lots of land, clay, and we grow guadua bamboo. You can promote your project on our Bulletin Board. (Link at top of page.) Keep us posted and maybe we’ll do a blog post about your work also. We live on top of a hill and I would like to build a storage shed into the hill somewhere. This looks like a fantastic way of doing it. Any suggestions on how to start? Keep reading our site. Everything you need is here. Use the built-in search engine to aid your search. Earthbags work great underground. Round structures are strongest. Use gravel bags on lower courses. thank you for your help. im planning to build a basement. so if my front of my basement floor is 9 feet to the ceiling of the basement, then when I put my floor joist In, which will be my floor for the up stairs I can build it another 9 feet tall and put my supporting walls on the inside of the house, right. then put my roof on top of that.if you have a better idea I would appreciate it. so I think ive got it figured out. thank you again owen for your help and god bless you. We’ve described 2-3 ways of building earthbag basements here on our blog. Frankly, they are experimental. No one has built this way to my knowledge. So you might want to build with more conventional materials. That’s a huge subject beyond the scope of this blog. Do you have an existing basement? Or are you planning to build a new basement? Existing: Build lightweight earthbag walls on top of the floor frame. New basement: Lots of options. The foundation will have to be as wide as the earthbag walls that sit on it. Did you say that you could use rice husks? Could you use pulped and dried up bamboo cut offs as an alternative? I used rice hulls in the video demonstration. They’re readily available in many areas and require no additional processing. It would be a lot of work to shred/pulp bamboo and would likely attract more insects and be more prone to mold than rice hulls. Sorry, I have one last question about the insulation, would you know anything about using coffee husks instead of rice hulls? They appear similar to rice hulls in online photos, although I have not seen them first hand. I can’t find any data online. I tried searching for coffee husk insulation and coffee husk r-value. Talk to local universities and research institutions in areas where coffee husks are most abundant. Someone somewhere has probably studied coffee husks in detail. Most detailed info like this never gets online. It’s in technical reports that are sitting on some shelf, and may be in another language. Please dig up the details and post it online or send it along so we can post it here on our blog. I’m far from an expert on the specifics, however, I am aware that somebody somewhere is doing research into using Bamboo Charcoal as insulation. I have heard claims that it is looking extremely promising. I confess that I don’t have much insight into exactly what they are doing or how they prevent the charcoal from being a fire hazard. I have no idea if there is any potential for the process to be DIY friendly. This comment is not intended as an endorsement or recommendation, simply as a heads-up about the possibility. That’s news to me. This link says bamboo charcoal is being woven into insulating fabrics. Numerous sites are offering products made with it. From what very limited knowledge I have, I think somebody is trying to adapt that technology or something very similar to it into housing insulation in some manner. I wish I had more to offer on the topic. I can imagine possibilities that could be really awesome. Perhaps even a new environmentally friendly product, or even better something that individuals could make themselves if they have a lot of bamboo growing near them. I can also imagine possibilities where it is such a commercialized manufactured product stuffed full of chemicals that it could become something really nasty. I don’t have a clue which way it might end up going. How and where do we purchase hemp insulation in Oregon, USA? What is the cost per foot? You’ll have to search the Internet. Is there anyway you could design a two (or three) bedroom earth bag house in the shape of an I-ching coin? (Round house with a square interior courtyard). This has been a dream of mine for some time and would love to see how you would do this. If you could do a two bedroom home, with an art studio instead of a garage that would be lovely. Thank you for your time. Yes, you could do that. I do custom plans. Sketch it out as accurately as possible on graph paper, add major dimensions, label the rooms, etc. and I’ll give you a free quote. My email is at the top of the page. hi there, i was wondering if you could direct me to a retailer of rice hull ash in north america. thank you for your dedication. You’ll have to google for suppliers or make your own. Large garden suppliers may have it. i have an orion shacklock wood fired stove/oven, (im in nz) i saw the picture you have here and wanted more information. i thought about putting cob around my fire but am wondering if my little home (3 meter by 9 meter) would get too hot? what process did you use to cob your wood stove? did you have an insulating layer eg. crushed pumice, (i have a small supply from the beach i can collect) i use my oven at least once a day in the summer and winter all day we are keeping it going. would having cob around the fire heat up the cast iron too much and cause cracking, would having the cob make the stove and oven more efficiant? This is the Contact page and so I don’t know what project you’re referring to. And keep in mind we mostly report on stories from other people and so we often don’t know the details. Also note, you’re asking specific questions that I can’t answer. It depends on your climate, how well insulated your house is, the size of the fire, stove quality, etc. etc. Sorry, but that’s the best I can do. Greetings from Norway and Lithuania!! !Where I can buy earth bags? Search the Internet for polypropylene bags in your country. You can also search for raschel mesh bags in your country. Most large cities have bag suppliers. They’re used for everything from sand bags to animal feed (dozens of uses). Get 18″x30″ bags (45 x 75 cm) measure when flat. Or get 18″ (45 cm) wide tubes. Would like to purchase plans for this project Triple Dome Survival Shelter. Where is the cheapest place to buy the 18×30 bags? Do they have to be polypropylene or will heavy mill plastic be ok? I am cutting out a hillside to place this in and then completely cover it up. Any recommendations? I just emailed you. You want standard polypropylene sand bags that measure 18×30 when empty. Also note, it would greatly speed construction if you had a backhoe or tractor for the excavation work. Most any subsoil will work in the bags. Make some test bags to be sure they dry hard. Pure sand will not work for what you’re doing. Add multiple layers of 6 mil black plastic sheeting to prevent roof leaks. Or splurge on rubber roof pond material if you have a lot of money. Hi, I was curious if people were allowed to come and volunteer with you guys? Or do you run any workshops? I live in Singapore, several years ago while living inMalaysia, I tried to build a round sand bag house. I got to the point where the windows were being put in and I gave up. I was so frustrated I didn’t know what to do and exhausted by the process. However, looking at your pics on youtube renewed my interest in sand bag work. We’re not building anything now. There’s no space left. But we bought more land and hope to build more structures in about one year. Not sure what building method we’ll use. I’ve already covered earthbag building in detail (3 buildings, one book, 1,000 blog posts, plus videos) and so I’m thinking of using CEB, maybe with pallet interior walls. Doing something new keeps projects exciting for me. I like to learn new things. We have articles about costs and cost estimating. These articles explain how to determine about how much your house will cost. Same with building codes. Use the search engine on our blog and look for keywords ‘building codes’. There’s nothing specific on Scotland, but you’ll learn the basics. And then you can talk to your local building officials to learn the rest. There’s a long history of earth building in parts of the UK (and growing awareness) and so it should work out okay for you. Pretty much everything you learn about cob building in the UK applies to earthbag building, although building with bags is much faster and easier. Good luck. I have a question. Would it be a good idea to use expanded shale for earthbag construction? I know it has properties similar to pumice. It seems that it would be a good insulator. Yes, it should work fine. Search this blog for more info. The bags won’t be as stable as regular earthbags of tamped earth and so you’ll need to use some added techniques to improve stability. See the Earthbag Scoria Casita house: http://www.naturalbuildingblog.com/earthbag-scoria-casita/ Watch their videos, etc. I’ve been trying to find updates on the Corganix kit. We would be building out of TX. Could you send me any info available? Everything I find on the web is about a year old. We just report on various products. You’ll have to contact the company directly. You could also send me your website if you have one and I’ll post a blog article about your project if there’s enough information that seems interesting to readers. You can also email me your plans (PDF or jpeg images) and I’ll take a quick look for free. becouse this is execly what that i am looking for to learn a specially the building in many alternative ways. i wounder if there is a chance to do a work trade – after all i am a beck peck from israel and if not i wounder if i can come for some time. i wish to my self to know much and then to go to some third world countried and to help them. I’m not doing work trade at this time. Search our blog for projects you are interested in and contact the people involved directly and I’m sure you’ll find some projects you can work on for free. Hey everyone, want to ask if anyone know where to buy bags and mesh bags in Europe? Use a search engine to find companies near you. Use search phrases such as poly bags, polypropylene bags, sand bags. The standard size for earthbag building is 18″x30″ or 18″ wide tubes. I sent you email several days ago about my house plan but haven’t heard back from you. I want to purchase the zero house #4 plan but I want it modified. Do I purchase the plan first, and then request modification? Or what do I do? Email me before buying anything. I’ll give you a fixed quote once I know for sure what you want. I think they could do a report of the association and the building we made in Spain. Hi Owen: Hope all is well with you. I have just uploaded a brief blog about an exciting earthbag project in Northern Chile. It is being done by our friend Felix Vargas and he`s doing a great job. He has lots of photo`s on his Felix Vargas facebook page. Thanks for the tip, Paul. I’ll post it soon. And congrats on winning that contest. hi! I really miss the full posts in the RSS feed. Will they be coming back? They wrote me and said they’re going to keep it like it is. I too am a big fan of RSS reading. One thing that could be good for truncating posts is that its more difficult to “steal” content from the site. The way people steal content from a site is by subscribing to a RSS and with scripts repost it on their own site as their own material. I do NOT know if that is the reason in this case. But… If you are reading your RSS in for example google reader there is a cool plugin called “Reader plus” that enables you to preview the website in google reader. I like it. Just google “Reader Plus google” + [chrome/firefox/ie/safari/opera] and see if it is available for your browser. Happy reading guys and girls. Your RSS link seems to be messed up. owen, I thought I had ordered and paid for your dvd, April?for Rucquoi Box 152,Tecopa,CA.92389 finally I am wondering what happened? Did this request fail to reach you? also I am excited about using the mesh bags, single? roll? do you have photos of yours using them? The DVD is available through Createspace and Amazon as explained in the link at the top of the page. You pay through them. If you sent money to me, I don’t remember it or have any convenient way to track the order. Did you email me previously? What mixture would you recommend for an earthbag house in a climate such as North Carolina, Virginia, West Virgnia (Applachia)? A wide variety of weather here and just don’t want to start out setting myself up for failure. Thinking 1 part cement, 10 parts soil, and 0.5 part lime. What are your thoughts on this? Are you asking about fill material (mixture in the bags) or plaster? Fill material: First, find out if you have codes and learn what they require. They may require stabilized earthbags with 10% lime or cement. If no codes, them most clayey subsoil will work. Make some test bags and see if they dry into hard, strong building blocks. Makes sense, I’ll pack some bags soon to see what I come up with. I’ve seen on the web someone recommending crushed limestone for bags since it will set similar to concrete when packed, any merit to this? For exterior work I’ve thought about stucco since a sprayer would make things a bit easier. Concerns about how it holds up to moisture and cold weather though. Thoughts? A couple in Arkansas is using crushed limestone on their dome. Search our blog for details. It worked fine except it expanded a little during freezing weather. Add a little cement and it should stay rock hard. As always, make some test bags and figure out what works best. Most earthbag builders use cement stucco on earthbag houses. Lime is great, too. Spraying is easiest for beginners. Check out the Mortar Sprayer that’s talked about on blog. please send me info whenever possible by email. What do you mean? You may have to resubscribe if you’ve been getting our email updates. I think that it would be a important feature to add a share button for Facebook and Goggle+. It take several steps out of the process to do it manually. I have many people that view my FB page and they love the articles. Can you create a ‘share ‘ icon for Facebook so I can re-post your blog? Contact Kelly or Kelly’s wife. See link above called About Us for email addresses. Jerry, I’ll see… these are part of the theme and it doesn’t have the share button but I will ask the developer. I recommend in my book and elsewhere to use double poly bags (one inside the other) filled with gravel on lower courses. Keep bags protected from sunlight as best you can. Make sure the bags, tubes and mesh are all the same size. Make samples to see if they’re the same width after tamping. Upper courses can be poly, burlap or mesh. But with burlap being more susceptible to decay, it would be best to stabilize burlap earthbags with lime or cement. Overall, mesh tubes are the fastest and easiest on upper courses. Wow. I did not check the spelling on that post AT ALL… Would you mind not posting that one as public to the site? I thought this page was for sending an email instead. I have a few brief questions, but first of all, thank you SO much for your dedication in making these building techniques accessible for novice builders! I admire your willingness to help us achieve our dreams! I have already purchased and read Owen’s e-book, and have done much reading of the online discussions related to earthbag building… My husband and I plan to build our home in Wisconsin, and are thinking of borrowing some of the passive solar concepts from the Earthship folks. I am working on some concept plans now, and will likely touch base again when we have them fleshed out a bit more. Since the help we will be having for this project will likely vary greatly, I was wondering your thoughts on combining woven poly bags with mesh tubing depending on how many hands we have available for work. I was thinking it would be best regardless to do the lower courses completely with poly mesh bags and lava rock due to the rain/snow load in our area… but after that initial build-up, would it be okay to switch to mesh tubing now and again provided we put two courses of barbed-wire between the woven poly and the first/last course of mesh? Since we don’t have earthquakes in our area, I didn’t think the difference of flexibility between the two types of construction would be that big of an issue. I am in Chicago currently, and have been checking with local factories to try and find sources for free, used bags…. If I am able to secure a source of burlap sacks of the proper dimensions, what tips would you suggest in building with those? Is barbed wire still needed? I would imagine that woven poly bags would still be best for the lower courses, but are there certain soil mixes that would hold stronger as the burlap naturally decays? Thank you again, and I very much look forward to hearing from you!